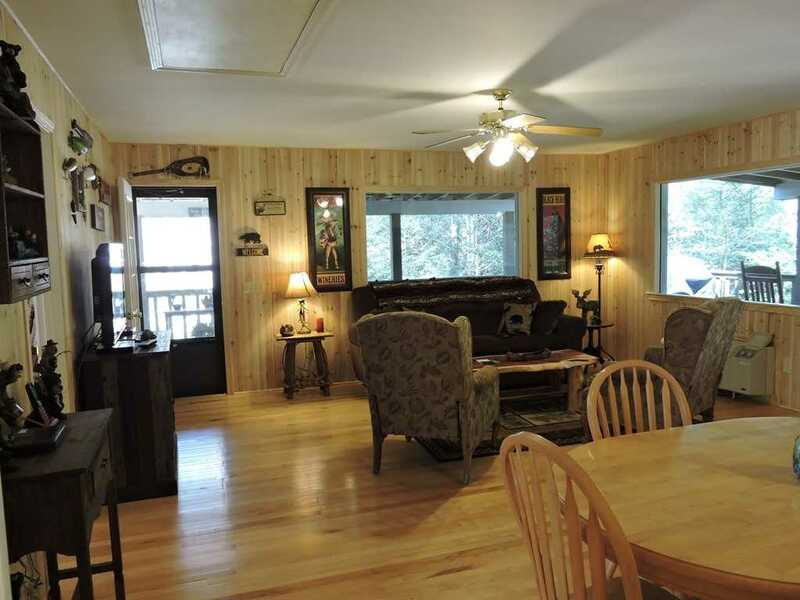 4 BR/2 BA, 6.5 acres and beautiful trout steam just below deck! 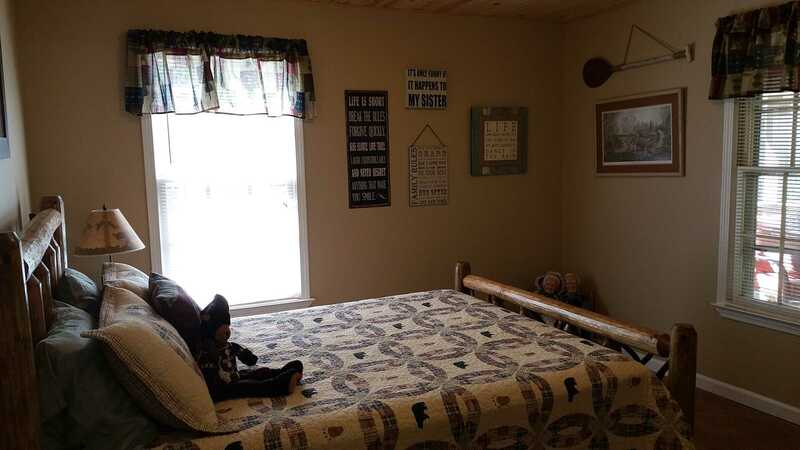 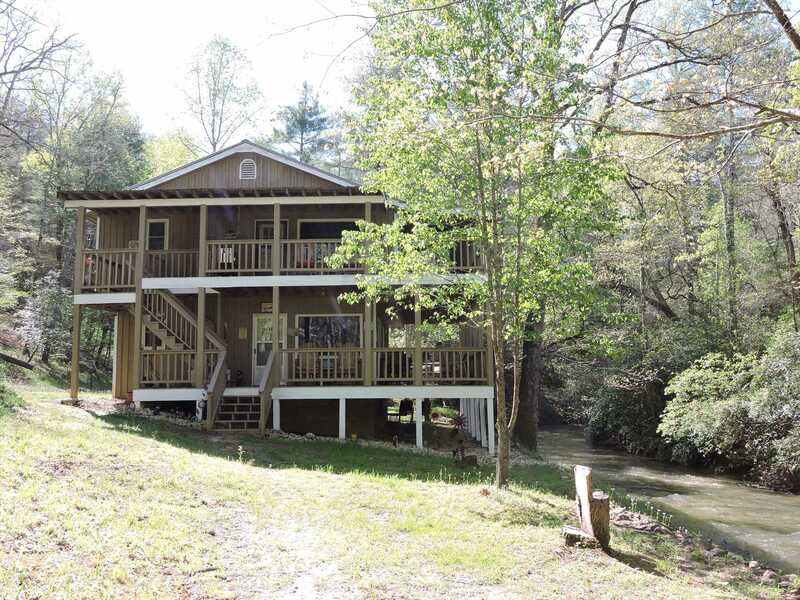 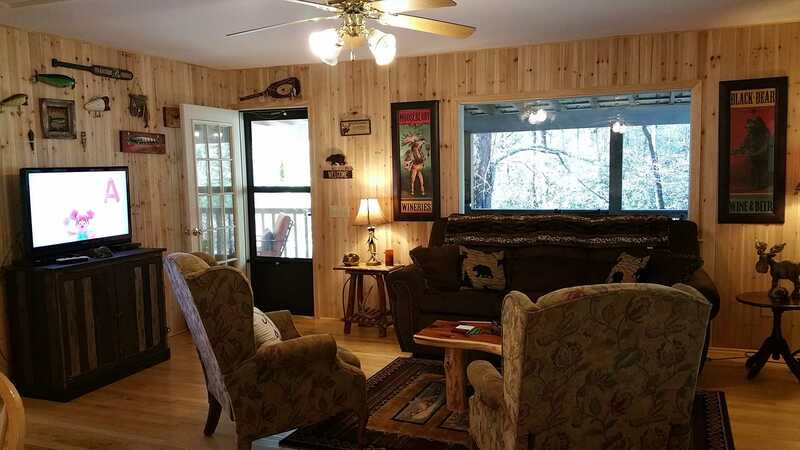 Wine down the River is a beautiful 2 story identical Cabin upstairs and downstairs. 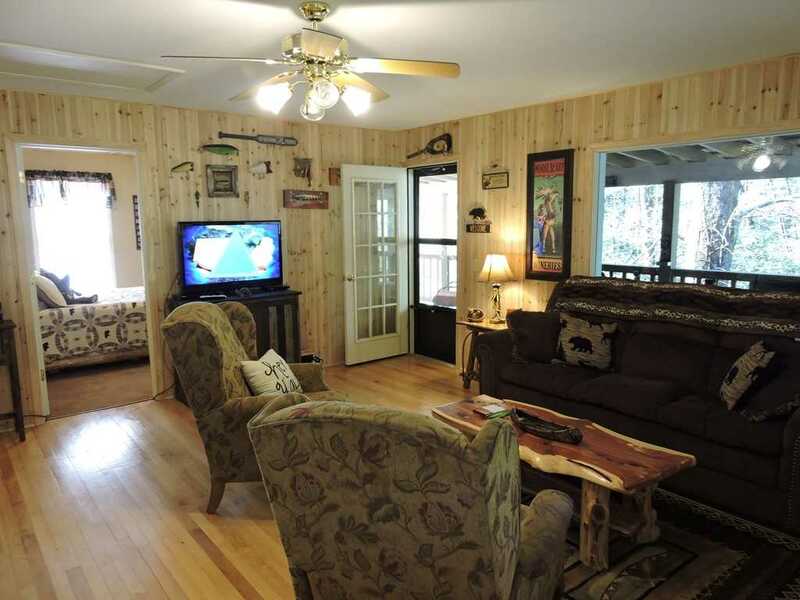 Sits on 6 plus private acres. 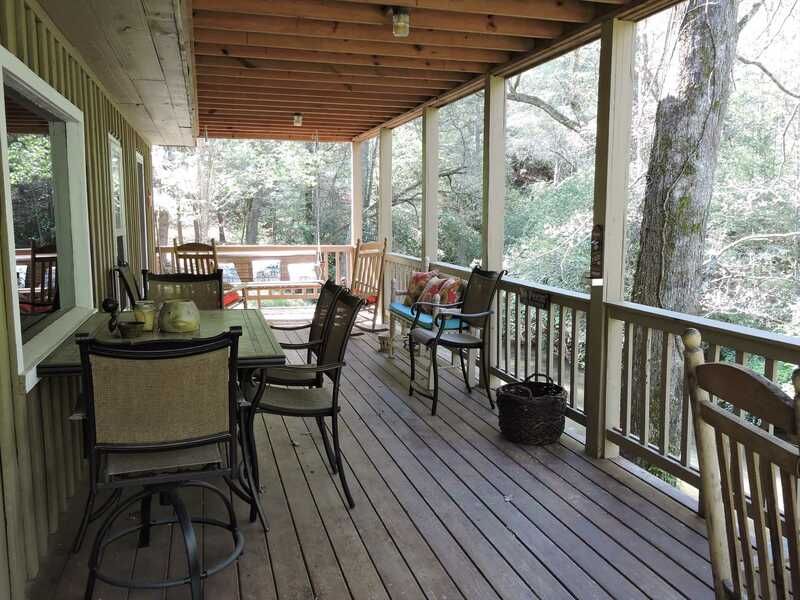 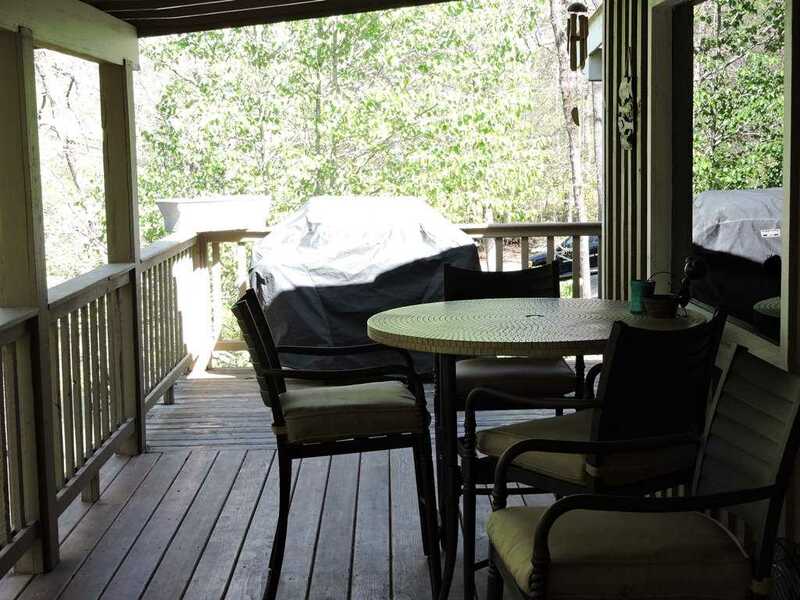 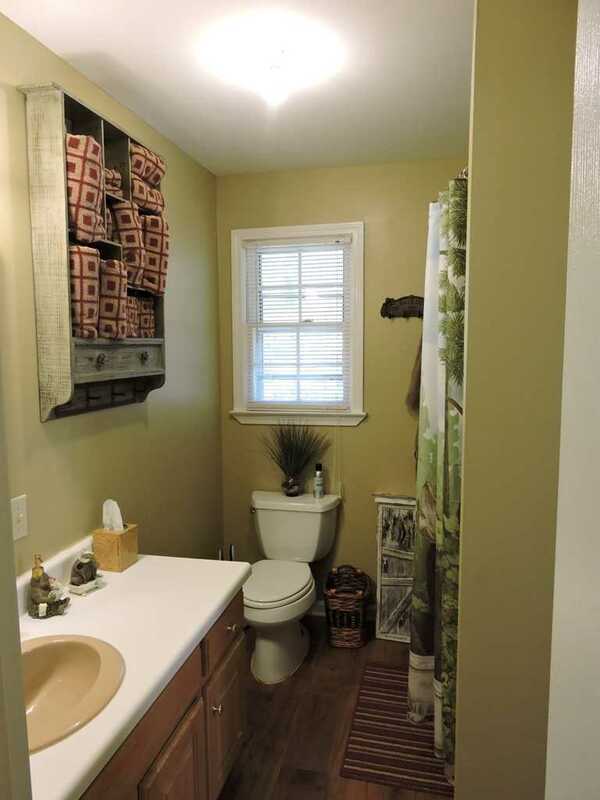 It provides spectacular views throughout the entire home overlooking the Trout Stream. 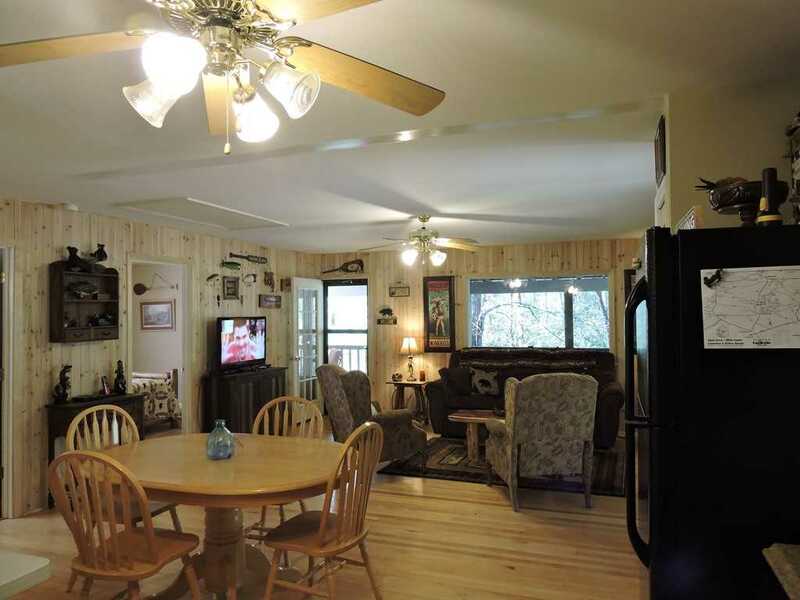 This home sleeps up to 10 people with ample space for everyone. 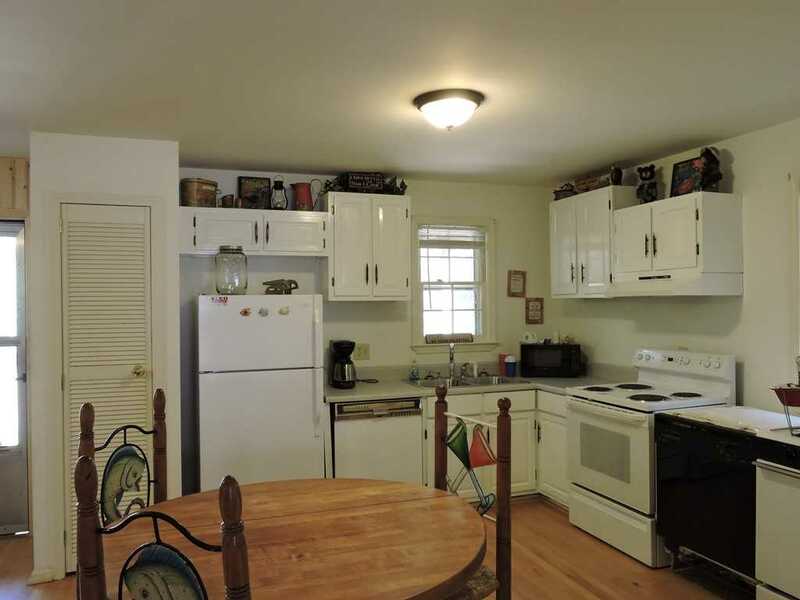 You have 2 bedrooms and 1 bath on each level. 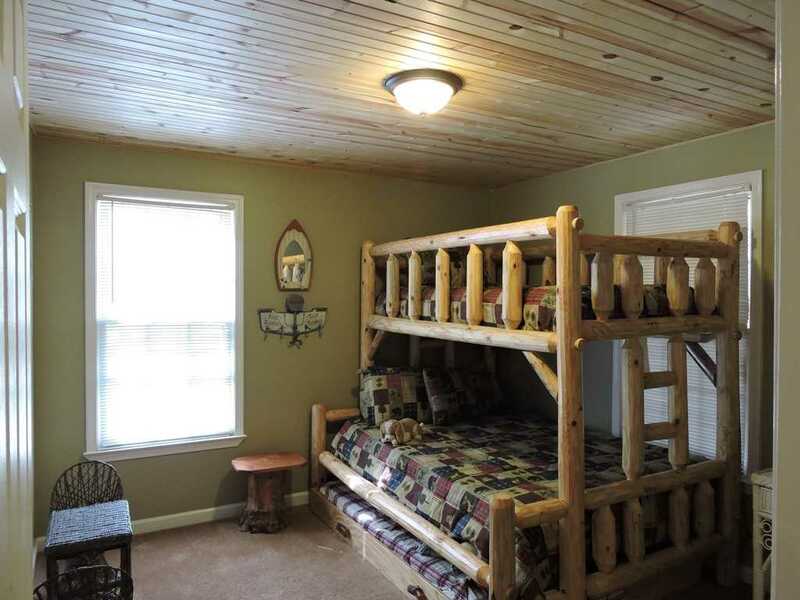 Downstairs: One bedroom downstairs has the log bunk bed that is perfect for kids (Twin on the top, Double on the bottom, and a twin trundle underneath. 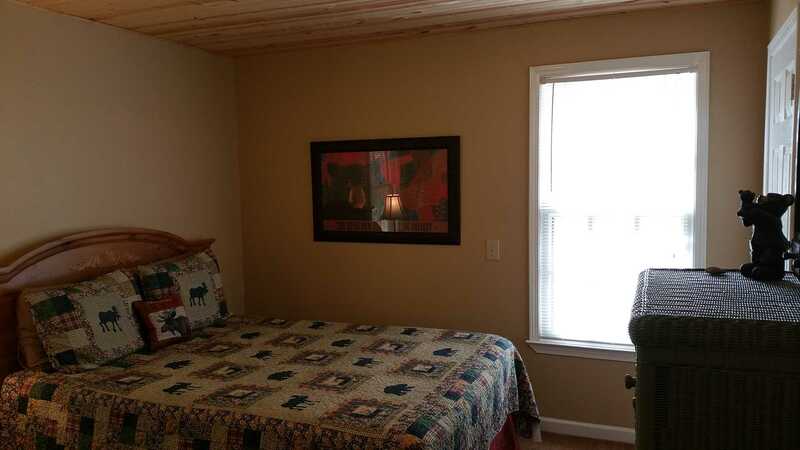 The second bedroom has a Queen bed with access for the bathroom thru the hallway and bedroom, (shower, toilet and sink). 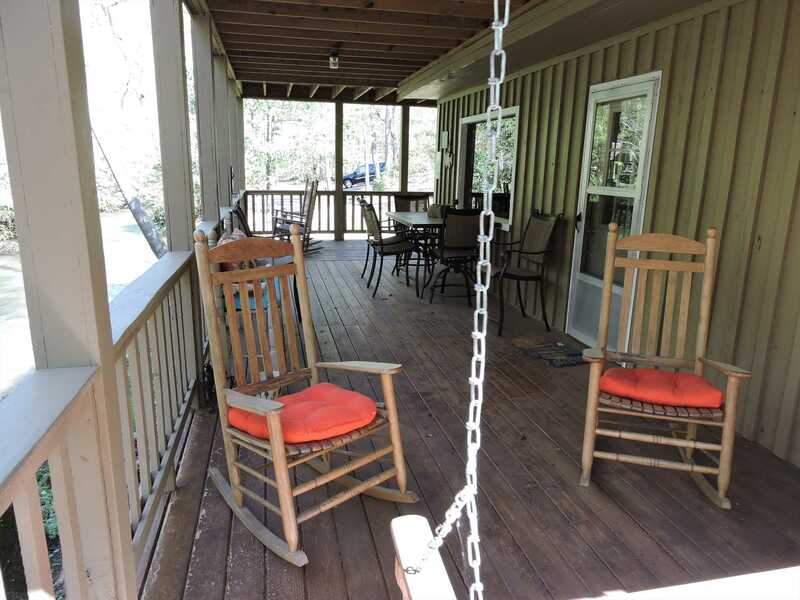 While you are relaxing in the recliner in the living room you can open both doors and listen to the river flowing thru the screen doors. 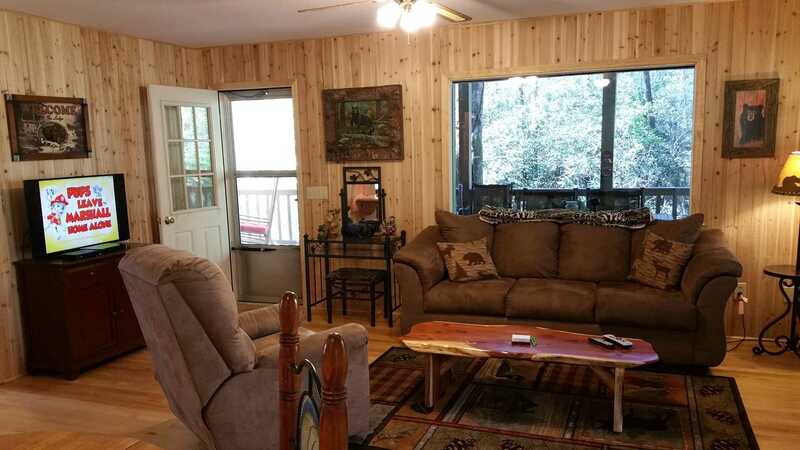 There are windows all around you so you can enjoy the peace and quiet of this location. 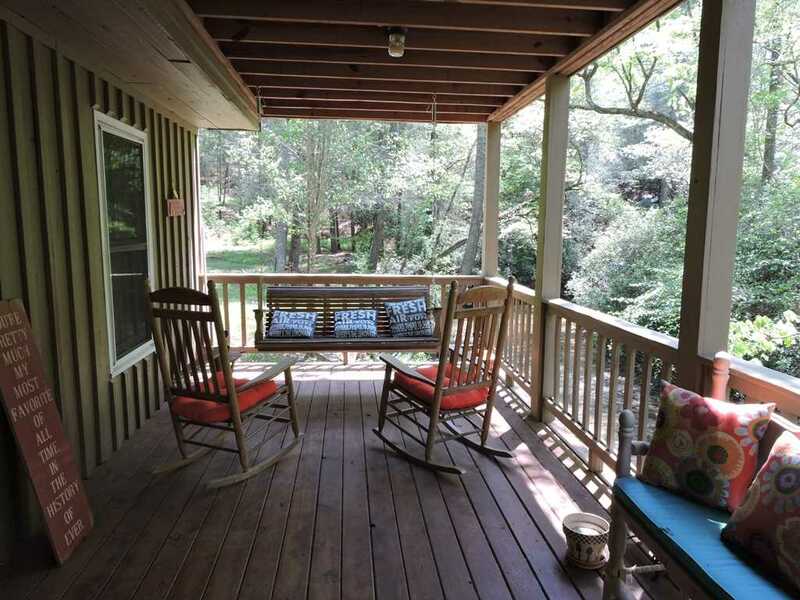 The patio downstairs has rocking chairs, gliders with plenty of outdoor dining options. 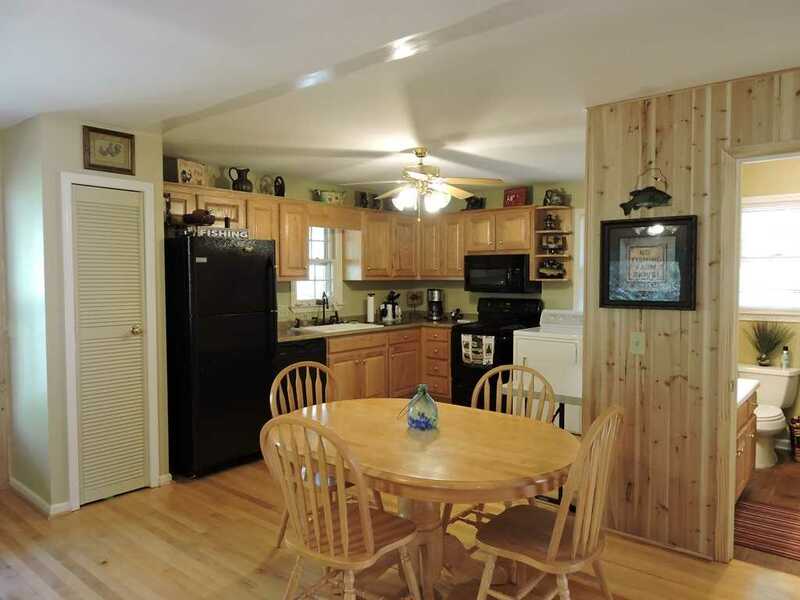 If you enjoy cooking inside this open kitchen has everything you will ever need. 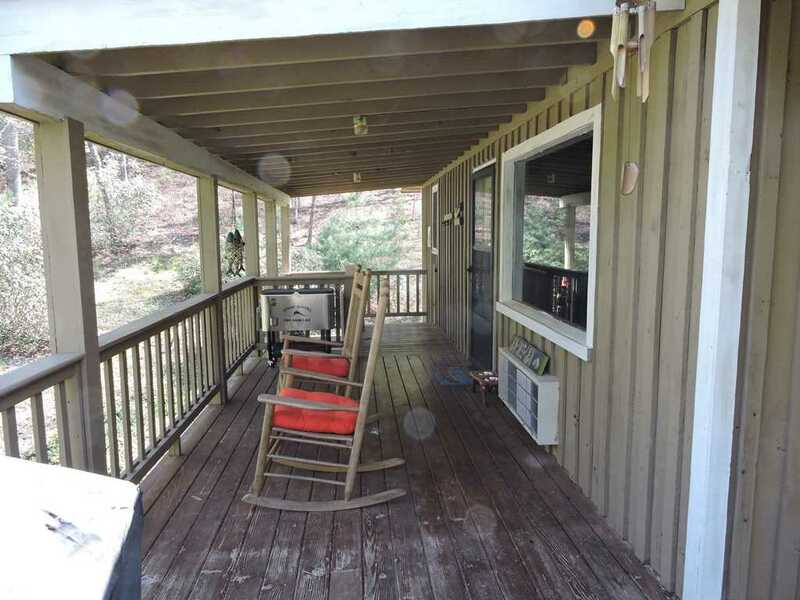 You are not limited to just cooking inside, you actually have a gas grill on the upstairs patio but also a charcoal grill by the river. 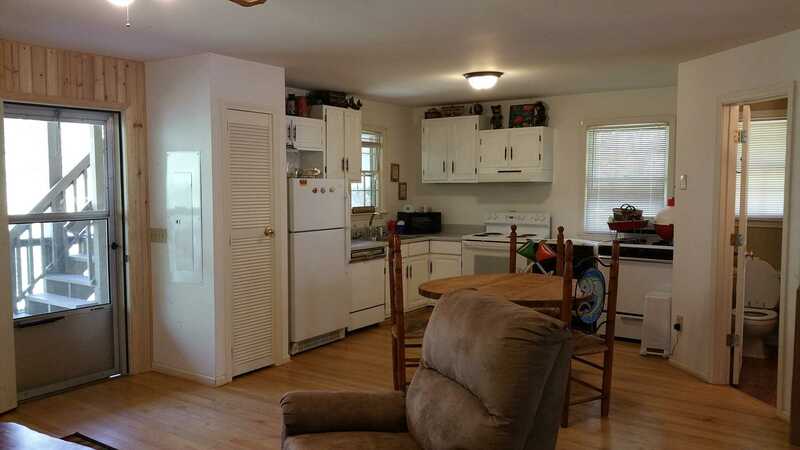 Upper Level: Has the exact same set up with just a few differences. 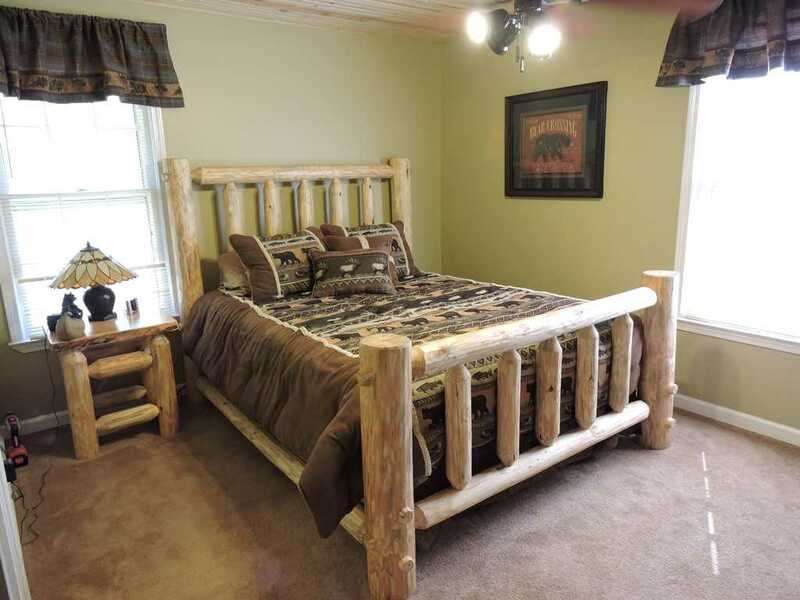 You have both bedrooms with queen beds and this bedroom has a tub/shower combination. 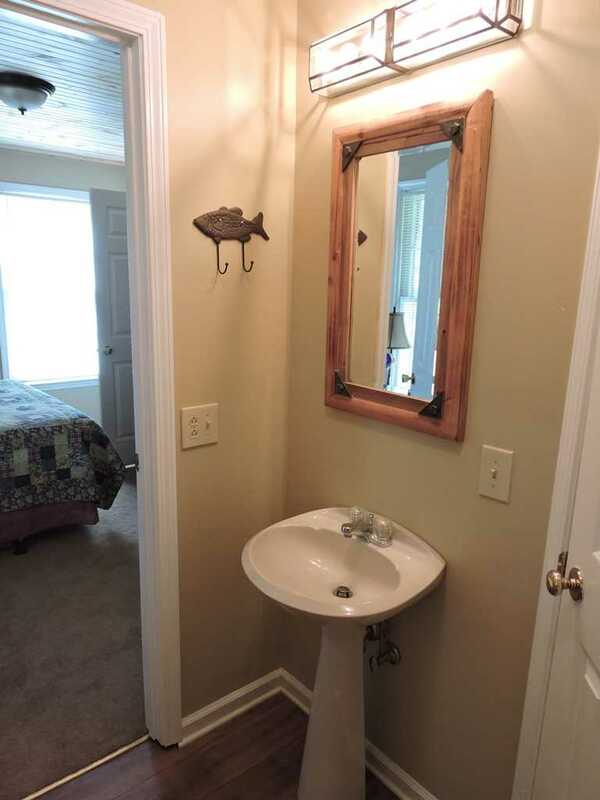 The full size washer and dryer is located upstairs for your convenience. 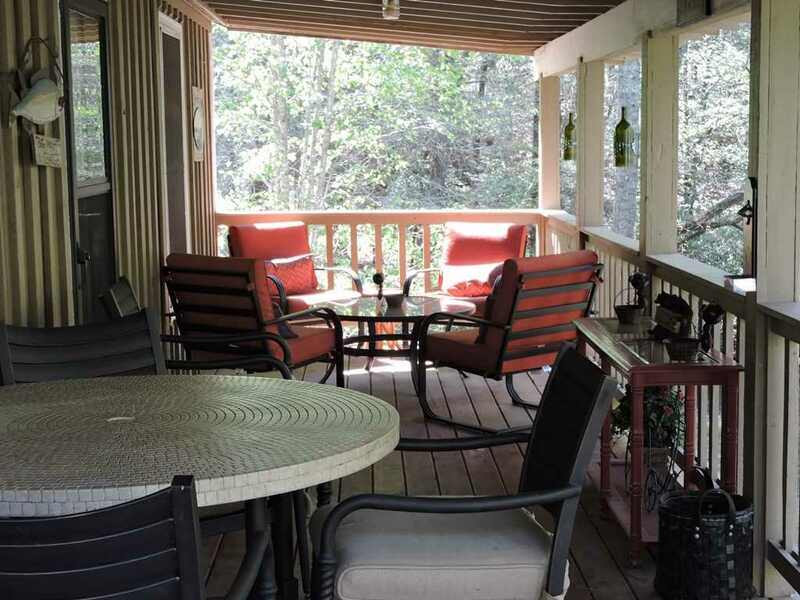 The upstairs patio also has plenty of sitting areas. 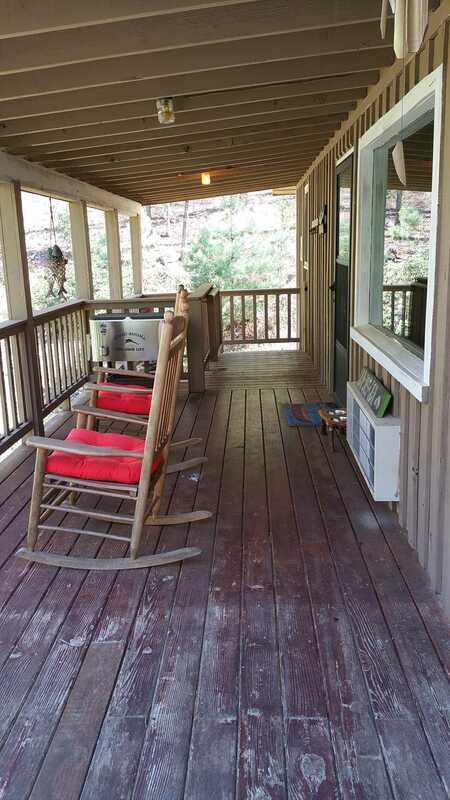 Upstairs offers a hanging swing that when you sit in this swing you will lose yourself in the peacefulness of the Mountain scenery. 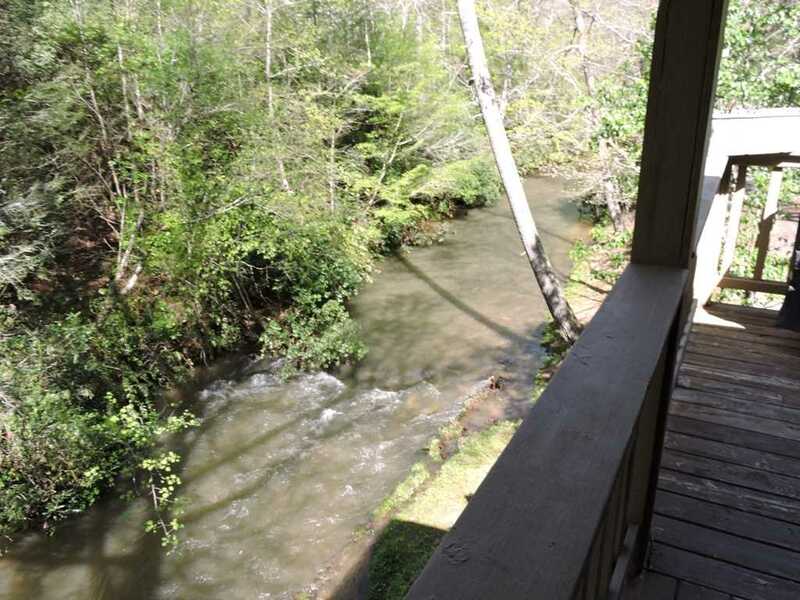 Trout fishing right off the balcony! 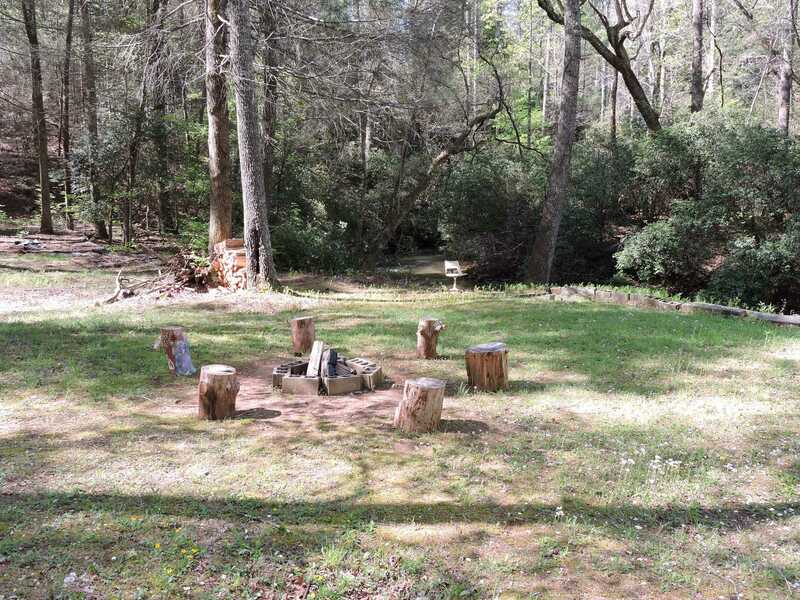 The property has everything you could think of from grilling, picnic tables, fire pits and access to soak your feet in the stream. 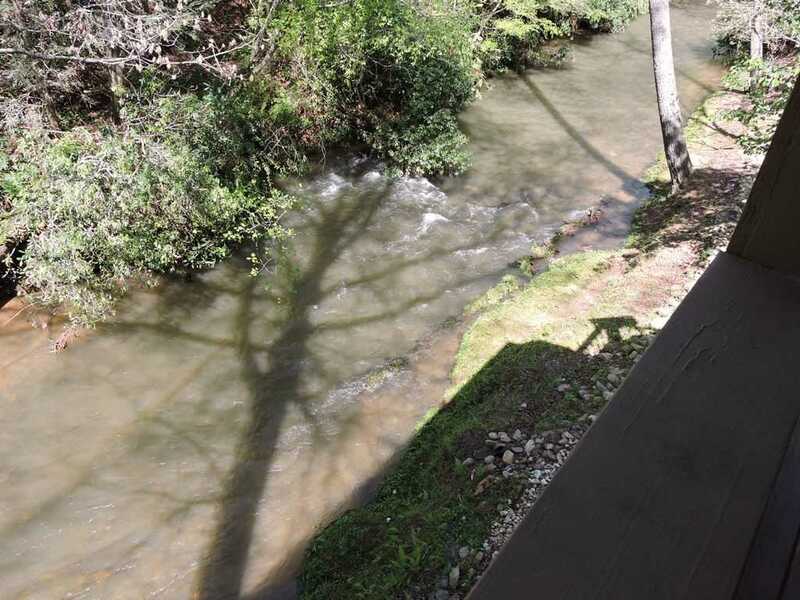 Wine down the River is a perfect place to escape with family and friends! 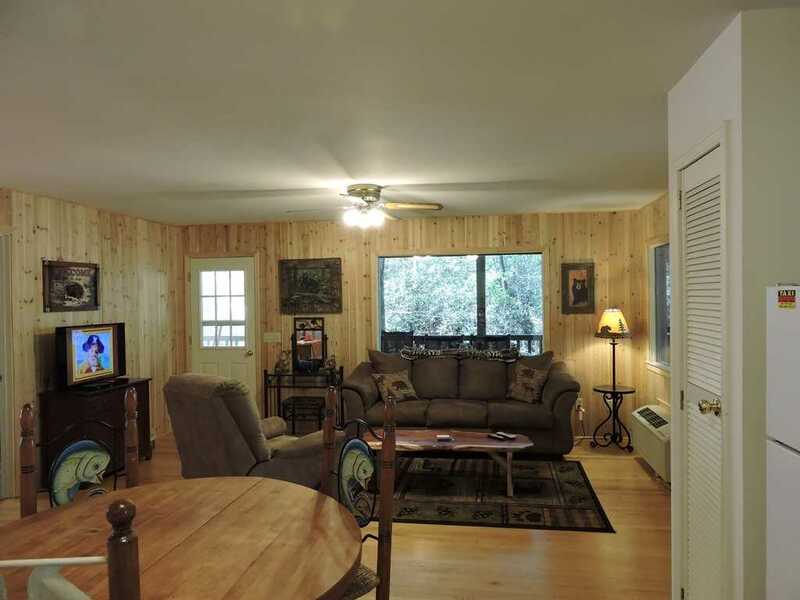 As soon as you pass thru the gate you will feel a sense of tranquility. 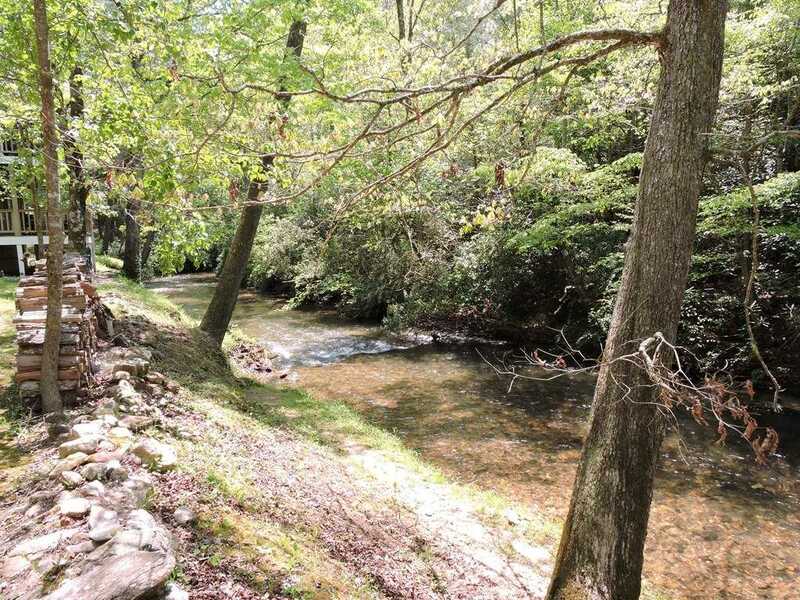 This property is about 14 miles from the city of Helen.